This escorted Italy tour combines Italy’s great cities Rome, Florence, Venice, with Italy’s smaller towns and picturesque villages including Assisi, Capri, Cinque Terre, Pisa, Sorrento, and Stresa. This trip to Italy travels from Rome through Tuscany and the heart of Italy to the Northern Italian Lakes where you’ll enjoy amazing vistas and the fresh Italian Alps air. Then cross Northern Italy from the region of Lombardy to Venice in the Veneto region. After Venice the trip continues to Southern Italy’s vibrant Campania region where you’ll stay in Sorrento and visit Capri and Pompeii. You may also join an optional tour along the Amalfi Coast to Positano. For more information about this all-inclusive trip to Italy with airfare from your city submit the form or contact ItalianTourism.us 800.227.1577. FLORENCE – Walking tour of the historic center. Visit the Accademia Museum to see Michelangelo’s David. 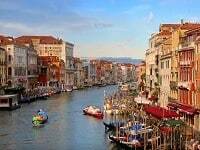 VENICE – Guided walking tour of Venice’s historic center including St Mark’s Square & Basilica. Tour Doges’ Palace and Bridge of Sighs; Enjoy Venetian artisian glassblower demonstration. Winter departures include 4 three-course dinners; Dinner on Day 5 not included. To make the most out of your stay join the Local Guide for a tailor-made itinerary featuring some of the city’s authentic jewels. With our optional walking tour you will have the chance to see the famous Spanish Steps, the Trevi Fountain and other sites and piazzas of Rome. A life-time experience! Journey through the celebrated Tuscan countryside to discover the charming village of San Gimignano, a little gem you should not miss out. Walking through the Old City means plunging into the Middle Ages and getting a taste of what the city must have been like more than seven hundred years ago. It is known for its famous towers, white Vernaccia wine, saffron, and olive oil. Legend has it that in the 12th century, rival families of San Gimignano began a tower-building competition to display their power and wealth and 72 towers were built. Today, the remaining 14 towers have earned the town its modern designation as “Medieval Manhattan”. Your adventure does not stop here. Take part to a traditional Tuscan meal, including coffee and drinks, in a picturesque country setting and enjoy the great food and wine that the region has to offer. This wonderful dinner with regional dishes is prepared using the finest local ingredients. Make your dreams come true and live the Tuscan life for an evening! Would you like to enjoy a special evening in Florence? Well here’s your chance. Savor a classic 4-course Florentine dinner with coffee and drinks, at a fine restaurant in the superb location of Santa Croce Square. Begin with the famous “Antipasto Toscano”, a selection of the best local olives, cheese, salami and home made ‘focaccia bread’, followed by a regional pasta dish and typical Tuscan style beef or fish for the main course. If you still have room you can end this delicious meal by indulging yourself with a sinful dessert – After all you are on holiday! Enjoy a boat ride to the privately owned island named in 1630 by Carlo Borromeo III after his wife Isabella. Tour the opulent Borromeo Palace, then time for the beautiful gardens and terraces. Travel to the enchanting town of Como for a boat trip on the lake. Admire pretty lakeside villages, imposing villas, exotic gardens, and free time in the heart of the picturesque Old Town. Taste four mouth-watering courses of local specialties and wine or soft drinks at a fine Venetian restaurant. After dinner, time to explore and absorb the unique, romantic atmosphere of Venice by night. Enjoy a ride in a traditional gondola, gliding through centuries-old canals, under famous arched bridges, past lavish palaces and quaint piazzas. These long, narrow, flat-bottomed boats with a high prow and stern were designed specifically for the Venetian canals and made in unique shipyards called Squero. Black is the obligatory color, due to a law passed to reduce how the rich and noble over-decorated their personal craft. The comb at the front of the gondola is made of iron and serves not only to balance the boat, but is also the symbol of gondolas and Venice. The six comb teeth represent the six Venetian districtsi sestieri. Note: the gondola is to be shared with other guests (maximum 6 participants on each gondola). There will be one musician on board of one of the gondola boats in your fleet. Appreciate the peaceful vistas of the Lagoon while you glide past the islands of Santa Elena, San Michele and the famous Lido. On picturesque Burano island, renowned for its lace making and colorful houses, savor a mouth-watering meal, with drinks included. Afterwards there’s time to shop and stroll. Enjoy a scenic drive up to the Madonnina, a breathtaking viewpoint over the Amalfi Coast. Free time to visit and shop in the quaint terraced village of Positano, a prosperous port of the former Amalfi Republic. See the Byzantine church of Santa Maria Assunta and its famous majolica tile dome. This is the land of the oldest and best pasta factories in the world, surrounded by golden lemons, tasty tomatoes and soft mozzarella cheese…The fertile volcanic lands around mount Vesuvius and the quality of their products were already treasured by the earliest travelers. A scenic dinner with view, an inside quaint fruit garden restaurant or a local old style authentic farm your Tour Director will choose for you according to the season how to enjoy the picturesque atmosphere of the bay of Naples, sanctuary of the Italian recipes known around the world. Enjoy an evening in a traditional restaurant, renowned for its cuisine and excellent service. Wine, soft drinks, and mineral water are included. 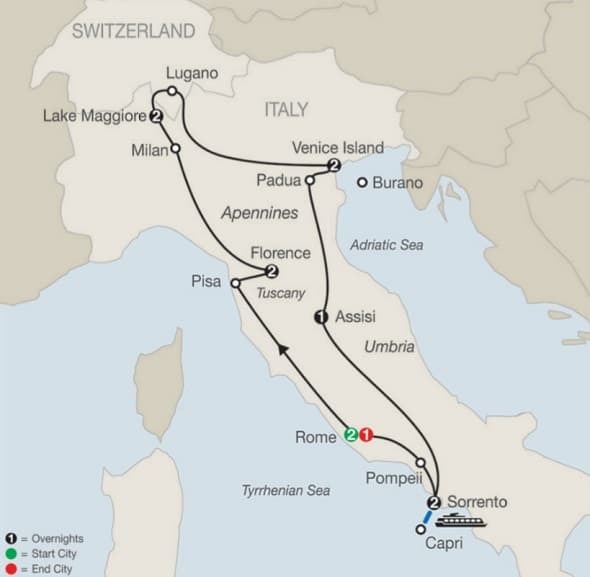 Check the box next to the Friday departure date of the Escorted Italy tour you would like to join. * Price published is LAND ONLY. Enter your preferred airport and submit form for the price of the Italy tour with airfare from your city. After an overnight flight to Italy this morning you’ll arrive in the Eternal City Rome. Check in to your hotel and get your walking legs. This evening meet your tour director and fellow travelers at a welcome dinner at a local Roman trattoria. Today you’ll visit the highlights of Rome. Start your day at the Vatican Museum. There you’ll enjoy a guided tour that includes visiting the Sistine Chapel where Michelangelo painted his breathtaking Last Judgement fresco on the ceiling and wall. Then you’ll have time in St Peter’s Square and St Peter’s Basilica. After you’ll cross the Tiber River to visit the Colosseum and Ancient Roman Forum. Later this afternoon there is an optional walking tour of Rome’s Piazzas in its historic center. Even if you decide not to do the tour you’ll want to stroll around Rome’s historic center to see its beautiful squares and fountains such as the Spanish Steps, Trevi Fountain, Piazza Navona, and the Pantheon. This morning you’ll travel by luxury motor coach from Rome to Florence in the region of Tuscany. Along the way the tour itinerary includes an excursion to Pisa to visit the famous Leaning Tower and Field of Miracles. Upon arrival in Florence check in to your hotel and then take a stroll around and enjoy dinner on your own or join an optional dinner evening with the group. Today you’ll wake up in Florence the city of the Renaissance and now the world’s largest repository of fine art. The tour begins with a walk through Florence’s historic center to the Accademia Museum. There you’ll see Michelangelo’s David sculpture. Then you’ll continue to the magnificent cathedral where Brunelleschi succeeded in designing an unsupported Dome. Next door is the Bell Tower designed by Giotto’s, and the Baptistry’s golden doors bas-relief “Gate of Paradise” designed by Ghiberti. The tour continues to Signoria Square and the Ponte Vecchio bridge over the Arno River. To enhance your stay, an optional excursion is available to San Gimignano, Italy’s most picturesque medieval town. Or join an optional tour if the Uffizi tour. 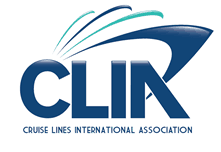 For more about the optional Florence tours Click here. Today you’ll travel from Tuscany to Northern Italy. The first stop is Milan, the fashion capital on the world. In Milan you’ll visit the world-famous La Sacala Opera House. Then you’ll stroll through the Galleria to visit the Duomo, the largest church in Italy after the Vatican. After Milan the tour continues on to Stresa on beautiful Lake Maggiore. This morning enjoy leisure time around the shores of Lake Maggiore in Stresa. 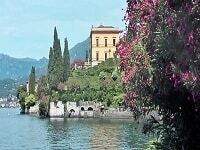 You may join an optional tour to Isola Bella to tour the baroque palace and peacock gardens. This afternoon you’ll enjoy a boat cruise across Lake Maggiore to Isola dei Pescatori where you’ll enjoy a special dinner of local Northern Italian specialties. This morning you’ll travel across the majestic Northern Italy landscape from the region of Lombardy to Venice in the Veneto region. Along the way you’ll cross the Swiss border and stop in Lugano. There you’ll have time to walk along the lake and stroll around Piazza Riforma. After its off to Venice to continue the tour of Italy. Upon arrival in Venice you’ll enjoy a private boat ride down the Grand Canal to your hotel. This afternoon enjoy an optional gondola ride. This evening enjoy free time in Venice and diner on our your. Today wake up in magical Venice. Your day begins with a walking tour of Venice’s sightseeing highlights. You’ll see visit St. Mark’s Square and St. Mark’s Basilica. You’ll tour the Doge’s Palace and walk through the Bridge of Sighs. The tour includes a visit to an artisans studio for a glassblowing demonstration. This afternoon enjoy an optional excursion to colorful Burano Island. Today the tour continues from Venice to Italy’s green heart, Umbria. Along the way you’ll enjoy an excursion to Padua, the sophisticated and lively town outside Venice. In Umbria you’ll visit the picturesque and peaceful town of Assisi. There you’ll St. Clare’s Church and the Basilica of St. Francis, where the tomb of St. Francis is and where Giotto’s frescoes are among the most important works to western civilization. This evening you’ll enjoy an authentic Umbria dinner with the group. This morning you’ll travel from the tranquility of Assisi in the region of Umbria to the vibrant and gorgeous Campania region in Southern Italy. There you’ll stay in Sorrento set up on the cliffs of the Sorrentine peninsula overlooking the Bay of Naples, Mt. Vesuvius and Capri. Upon arrival you’ll have time to stroll around and explore this quaint and picturesque seaside town. Today you’ll travel across the Bay of Naples by high speed ferry from Sorrento to the Isle of Capri. There you’ll tour the island including visiting the beautiful Gardens of Augustus. Then you’ll have free time to explore the town and its fashionable Made in Italy boutiques. This afternoon you’ll return to Sorrento with free time to relax. 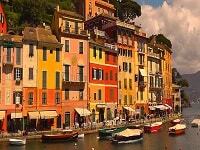 Or you may join an optional excursion to the breathtaking Amalfi Coast and Positano. This morning you’ll depart Southern Italy for Rome. Along the way the tour will stop in Pompeii for an escorted tour of this ancient Roman city both destroyed and preserved by Mount Vesuvius eruption in 79 AD. This evening, back in the “Eternal City,” a special farewell dinner with wine and opera entertainment awaits you at La Carovana restaurant as a proper way to say arrivederci, Roma. Today your beautiful and comprehensive trip to Italy ends with breakfast. Transfer to the airport or extend your time in Italy.